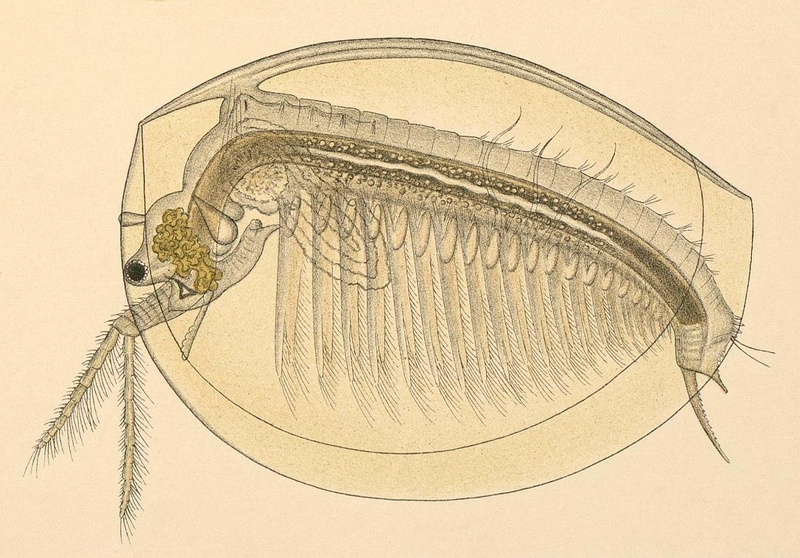 Limnadia lenticularis, from Sars (1896). The Spinicaudata are a group of clam shrimps characterised by the formation of clasps on the first and second pair of thoracopods of the males. [MD01] Martin, J. W., & G. E. Davis. 2001. An updated classification of the Recent Crustacea. Natural History Museum Los Angeles County, Science Series 39: 1–124. [T06] Timms, B. V. 2006. The large branchiopods (Crustacea: Branchiopoda) of gnammas (rock holes) in Australia. Journal of the Royal Society of Western Australia 89 (4): 163–173. [WZK06] Weeks, S. C., M. Zofkova & B. Knott. 2006. Limnadiid clam shrimp distribution in Australia (Crustacea: Branchiopoda: Spinicaudata). Journal of the Royal Society of Western Australia 89 (4): 155–161.